NEW ORLEANS – The UW-La Crosse men and UW-Oshkosh women enter the week of the NCAA Division III Indoor Championships as the No. 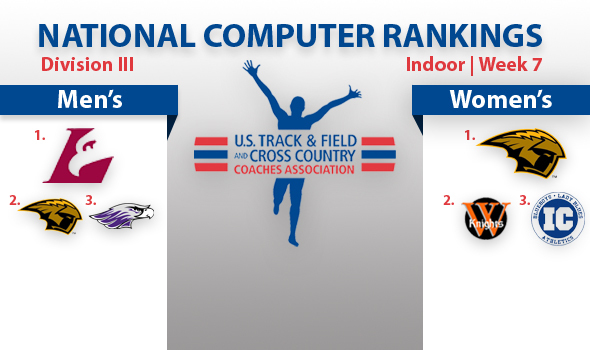 1 teams in the U. S. Track & Field and Cross Country Coaches Association (USTFCCCA) National Team Computer Rankings, which were released Monday. The NCAA Championships will take place March 8-9 in Naperville, Ill.
With 16 entries into the Championships – most of any men’s or women’s team in DIII – UW-La Crosse (227.38 team points) is in position to earn its first team title since 2009, when it split the crown with in-state rival UW-Oshkosh. The Eagles are one of just two DIII men’s teams with entries in six of the seven disciplines at the Championships, lacking only a combined events qualifier. UW-La Crosse features qualifiers in the jumps (5), sprints/hurdles (3), middle distance (3), throws (2), relays (2) and distance (1). Right behind UW-La Crosse and also gunning for its first team title since 2009 is UW-Oshkosh with 191.18 team points. The Titans will field the second-most championships entries with 13, including a division-leading seven in the two throwing events. Jumps will also be a strength for the Titans, with four entries. UW-Whitewater is No. 3 with 130.67 team points and 10 entries to the NCAA Championships, third-most among men’s teams. With five entries in jumps events, the Warhawks will field the most in the discipline, tied with UW-La Crosse. A title for UW-Whitewater would be its first in program history. Three-time defending champion and host North Central (Ill.) enters NCAA weekend No. 4 in the rankings with 86.98 team points, making for a tough uphill battle to claim its fourth consecutive indoor title. The Cardinals’ eight entries into the championships field are tied with Mount Union for fourth-most by men’s teams. Moving up three spots from a week ago to No. 5 is Bates (86.98 team points). The Bobcats will bring seven entries to Naperville, including four in the throws events – second to only UW-Oshkosh. UW-Oshkosh may not have the most entries into the NCAA Championships with nine, but the Titans (145.89 team points) will bring some heavy hitters to Birmingham, Ala., including Christy Cazzola, the all-time DIII indoor mile and 5000 meters record holder. Cazzola, also in the DMR, will team with a DIII-leading six entries in the throws events to go for the team title. Defending national champion No. 2 Wartburg (111.41) claimed the distinction for most NCAA entries with 13, making it the only women’s school with double-digit representation. The Knights are the best-represented women’s squad in DIII in the sprints and hurdles with five entries. They also field three throwers and are one of just two women’s schools to enter teams in both the 4×400 and distance medley relays. A title would be the Knights’ second in a row and their fourth in five years. Illinois College moved up a spot to No. 3 in the final indoor rankings with 106.83 team points, and will be represented by four entries into the national championships. Melissa Norville represents three of those entries as the top-ranked performer in the long jump, triple jump and 60 hurdles. If Illinois College could win a title it would be the first in Lady Blues history. Displace to No. 4 by Illinois College is Williams (97.51). The Ephs will be represented by eight entries into the championships, tied for third-most among women’s teams with UW- La Crosse. Of those eight entries, five will be participating in the jumps – most of any team in the field. The Ephs last won a title in 2007. Rounding out the top five heading into Birmingham is Emory, up two spots from a week ago with 79.56 team points. This marks the Eagles’ all-time highest ranking by the USTFCCCA, improving upon their previous high of No. 7 last week. The Eagles land in Alabama with six entries into the championships – tied for fifth-most among women’s teams – half of which come in the sprints and hurdles.